This miche is a hit! We baked a miche the last day of the SFBI Artisan II (sourdough baking) workshop. This was one of the breads we mixed entirely by hand. The students' miches were scaled to 1 kg, as I recall, but our instructor baked a couple larger ones, using the same dough. These miches were among the favorites of all the students for the wonderful texture of their crust and crumb and their flavor. I gave one of mine to brother Glenn, who has stopped reminding me in the past few days that I promised him the formula. This formula is substantially different from the miche formula in Advanced Bread and Pastry. I blogged about the background of that miche last month. This one is more similar to contemporary versions such as that of James McGuire, Hamelman's adaptation of which is found in Bread. 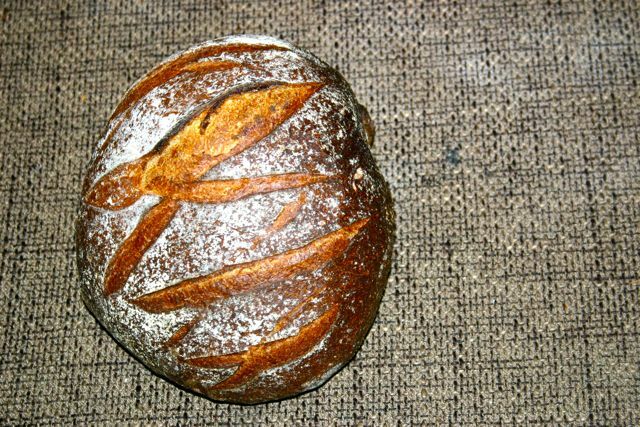 The formula we used at the SFBI calls for mostly white flour, with a little whole wheat in the levain refreshment and a little toasted wheat germ in the final dough. From my reading, a high-extraction flour is preferred for miches. I had some of Central Milling's “Organic Type 85” high-extraction flour on hand, so that is what I used. 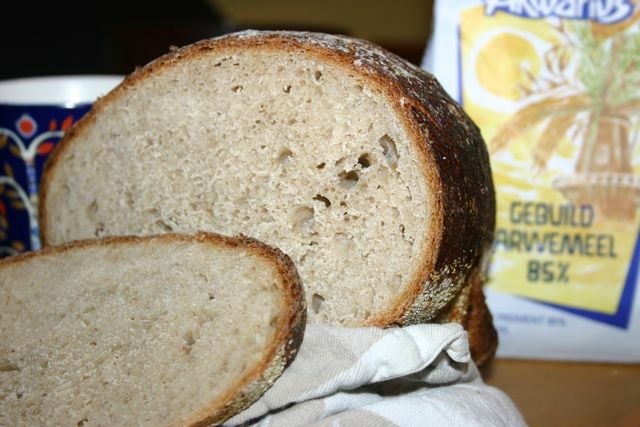 I did not use wheat germ since I was using high-extraction flour, but this ingredient did contribute to the great flavor of this bread as we made it in Artisan II. Dissolve the starter in the water and mix in the flour. Desired Dough Temperature: 78ºF. Dissolve the levain in the water. Add the other ingredients and mix thoroughly by hand. DDT: 75-78ºF. Transfer the dough to a lightly floured board. Pre-shape as a tight boule. Cover and let rest for 20-30 minutes to relax the gluten. 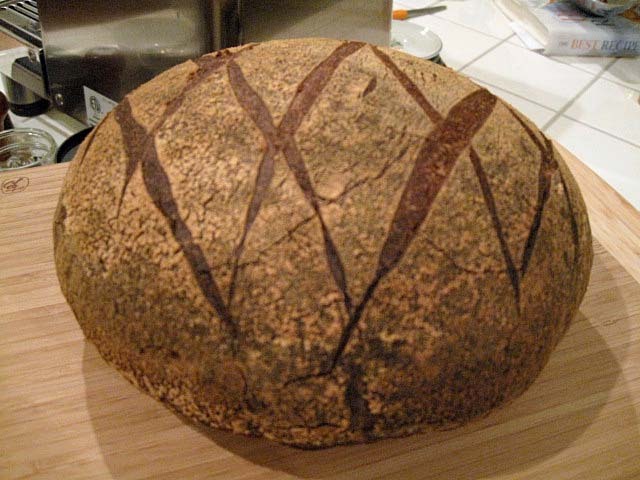 Shape as a tight boule and place, seam side up, in a floured banneton. Cover with plastic and retard overnight in refrigerator. 45-60 minutes before baking, pre-heat the over to 500ºF with baking stone and steaming apparatus in place. When the loaf is proofed, transfer the boule to a peel. Slash the boule as desired, and transfer it to the baking stone. Steam the oven and reduce the temperature to 450ºF. Bake for 20 minutes, then remove any water remaining in your steaming apparatus. Remove the boule to a cooling rack, and cool thoroughly before slicing. Traditionally, we were told, this bread is scored in a diamond pattern, but any scoring pattern that pleases you is fine. Just be aware that the diamond pattern tends to yield a flatter profile loaf than a simple square or cross. This bread benefits from a very bold bake. The crust should be quite dark. It may look almost burned, but the flavor and crunchiness that is desired requires this. This type of bread often improves in flavor very substantially 24 hours after baking. I sliced and tasted the bread about 4 hours after removing it from the oven. The crust had crackled nicely and was very thick and crunchy – the kind that results in crust flying everywhere when you slice it. 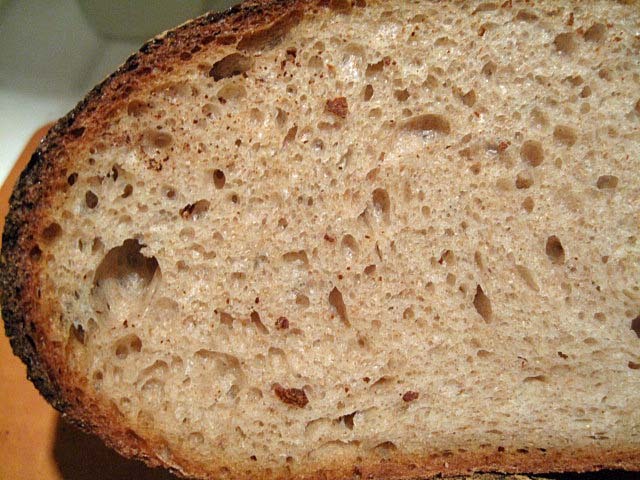 The crumb was well-aerated, but without any really large holes. The crumb structure is similar to that I got with the miche from BBA made with this flour, but a bit more open. The crumb is chewy-tender. 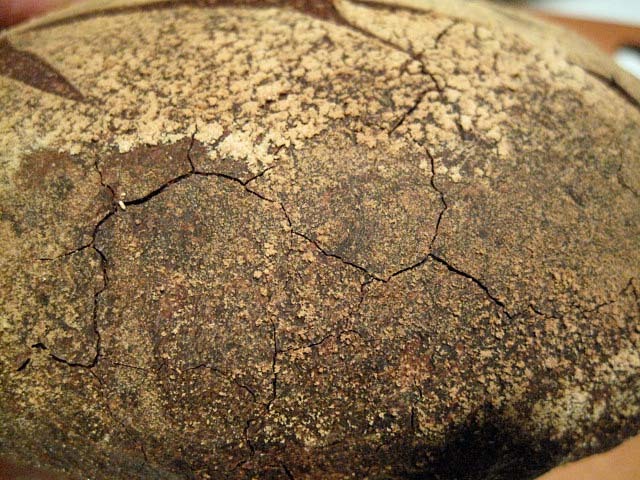 The flavor of the crust is very dark – caramelized-sweet but with a bitter overtone where it is almost black. The crumb is sweet, wheaty, nutty and absolutely delicious. My note above notwithstanding, it's hard to imagine the flavor getting any better in another day. I am enormously impressed with the flavor of the breads I have baked with Central Milling's “Organic Type 85” flour. I want more of it, and I want to try some of their other specialty flours, including those they mill for baguettes. I will definitely be baking this bread again. I would like to make it as a larger miche, say 2 kg. Next time, I will lower the oven temperature to 420 or 425ºF when I switch to convection bake for the crust to be slightly less dark. Hello David, Thank you for posting the SFBI Miche formula. I look forward to trying this. Your miche is beautiful - I love the diamond scoring! This one will definitely sing your song! :^) I surely do hope so! I really am grateful you've posted another SFBI Miche formula. I was thrilled with how my first SFBI Miche turned out and it will be fun to try this one next. This is the one I've been waiting for - thanks David! Love the look of that crumb! Too bloody hot to bake here at the moment, but as soon as we get some respite, I'm going directly to this one without passing Go! I know you will enjoy it! Let us know how yours turns out. Very pleased with how it turned out, although mine is a far more modest version that doesn't quite qualify as a miche - too small. So I've called it a boule! I made a few mods for reasons I've outlined in my post here. Thanks again, David. A lovely bread! I'd love to give this formula a try. Am I on the right track? My understanding is that atta is generally made from wheat that is more like (identical to?) durum wheat than hard red winter wheat. I would think atta would give a different flavor and performance, but it might be to your liking. We have a lot of flours available here in Japan...but even after consulting Hamelman's "Bread" I'm none the wiser...I now understand what "High Extraction Flour" means, but I wouldn't know what to ask for in Japanese! Hmmm, what a beauty David. Absolutely perfect crumb for my taste, and nicely gelatinized to boot. No wonder it's a hit, just from appearances alone, but I can also tell there's a lot of flavour going on as well from the way the crust gradually colours into the actual crumb. That's good baking IMO, and a great loaf. Thanks for sharing the recipe and your notes. Mmmm, when I return back home this week this loaf is on the agenda! By the way, do you special order your flour directly from Central Milling? Since I have heard you mention Central Milling and this type 85 flour a few times, I think this morning when my rep arrives at the bakery I will ask what he has to offer when it comes to Central Milling and see what goodies I can get my hands on! It is Snyder approved afterall! My brother picked up the flour at the CM warehouse for me. Since he drives by Petaluma pretty often on the way from SF to his north coast get-away, I hope I can use him as my "distributor" in the future. Their web site lists a vast array of flours and grains. Unfortunately, they don't describe their specialty flours or provide specs online. Hmmmm ... I may have to plan a visit myself. Nicky Guisto recommended their Type 85 flour as closest to the flour that Lionel Poilâne used for his Miche. Frankly, I like the one I made better than how I recall Poilâne's bread from the taste I had of it in Paris. That was quite a while back though, and I'm planning to do a bakery tour of Paris this Spring. In all fairness, Poilâne deserves a second chance, don't you agree? Great miche! This has to be the formula to test the high extraction flour with that I found after turning this city upside down (Amsterdam). But this one is a no brainer; 85% "bise-flour", and from what I read on the net and on this site, it must be the "strong stuff" I was looking for. Can't wait to get started on this miche with the high extraction flour! I succesfully revived a rye sourdough starter after a long sleep in the fridge. One question I hope you can help me with: I usually make stiff starters, and this formula asks for a liquid starter. How much of the stiff starter would I use in this formula? P.S. Whilst managing my profile and bookmarks, I realized that about 50% of my "favorites" come straight from your pages and comments. I guess a big THANK YOU! is appropriate! And, just out of curiosity; your last name suggests a Dutch heritage, is that the case? It sounds like your flour is just perfect Let us know how it turns out for you. The family name is of German origin linguistically, although my grandfather immigrated to the US from Russia. We don't have any Dutch connections, to my knowledge. My rye starter is roaring and all ready to go after a few days of refreshing. I'm going to feed it into a more liquid state. Can't wait to try this miche formula! From the photo, I'd say I'd prefer the crust somewhere between yours and mine. Looking forward to seeing your crumb and hearing how you like the flavor of your bread. Perfect in every way David! The scoring shows a well trained hand. The luster of the crumb speaks flavor as Franko suggests above. Well done! I've been searching for a local source for Central Milling products since I started looking at Tartine. Nicky says he will ship me 50# bags but the freight is $50 so I'm still looking. Would you make a suggestion on how we can approximate the high extraction flour? I have seen combination's of WW and AP that seem to get in the ball park. Perhaps sifting the WW to remove the rough component? Getting the flour right has a lot to do with a successful miche. I've seen so many different AP:WW ratios for approximating high-extraction flours, I just don't know what to recommend. I provided information regarding the original SFBI formula, and will clarify if needed. I can say (and Glenn can substantiate) that the SFBI formula produces a spectacular bread. They just used some WW flour to feed the levain, but then added toasted wheat germ to the final dough. I may try this bread again with added toasted wheat germ, even using the Type 85 flour. My best suggestion is for you to visit Petaluma with an empty suitcase. The nearest airport is Santa Rosa. Plan B might be to call Nicky Giusto and find out if they have a distributor in the mid-west. My local market that carries bulk flours says they will order me a bag (50#) of whatever their distributor carries. Since this is just added to their own order, there is no shipping charge to me. It's still a lot of flour, and, if it has wheat germ in it, it should be frozen or refrigerated if not consumed within a reasonable time. Very nice loaf. And thanks for posting this formula (finally!). Now I can thaw and eat the last piece of your SFBI miche. One question, though. If the formula calls for bread flour plus a bit of germ, how similar is your version with 100% Type 85? I'd think your version would have a lot more germ and bran. I have had great success with Central Milling's flours. 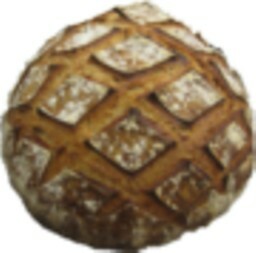 I like the Organic Type 85, and the Organic Artisan Baker's Craft (the flour Acme uses for baguettes, as I understand it). As to sources for Central Milling Flour out of the Bay Area, I have not heard of any. I did hear that Nicky will now sell 5 pound bags of most things if you call ahead and pick up (I know that doesn't help much for people who are distant). Comparing the SFBI miche with the one I made with Type 85 flour: The flavor is very similar. My loaf had a less open crumb. This is probably due to the increased bran in the high-extraction flour. I could offset this somewhat by increasing hydration a bit. Either way, the bread is going to be wonderful. Both Susan and I really love the flavor of the breads I've made with CM Type 85 flour though. We need to figure out just how I'm going to get my next delivery, and I'd like to try that other CM flour you're recommending. I live in Idaho & was able to order CM flour direct from the company. I ordered 4 5#bags, but could've ordered more, or less. They are very nice & helpful. Whole Foods 365 Organic comes from Central Milling, right? If Whole Foods Stores 365 Organic Flour is from Central Milling maybe Whole Foods sells a high extraction flour too or could order it. WF is about an hour from us in Ohio which is a lot closer than CA. Has anyone used the 365 Organic that I think sells for $3.50/5lb. Also, what about KAF's First Clear Flour, isn't that a high extraction and can it be used in this recipe? Your loaf is gorgeous David! Yes. My understanding is that WFM 365 AP and Organic AP flours are from Central Milling, at least in CA. However, I don't know which of their several AP flours is sold by WFM under their 365 brand. KAF First Clear is milled by a different process than high-extraction flours. It has a distinctive flavor. I like it, but it's not the same. I have used in many times to make miches, and liked them. So, "You pays your money, and you takes your choice." the whole thing looks perfect, David! I think you've nailed this very traditional bread. I'd be interested in the results of a really large loaf - I understand they can stay fresh for quite a long time. I wonder how Heartland Mill's Golden Buffalo would work out with your formula. I bought a 10 lb bag of GB 2 or 3 years ago. I baked several miches with it and did not especially like the flavor. I much prefer CM's Type 85. Others who baked with GB liked it though, so you have to judge for yourself. We have a whole foods not to far from here...I will have to check out their flours! The crumb looks so delicious! Thanks for sharing the nicely written formula! Beautiful, David! Lovely miche!Do you think it may use some extra final fermentation time? The crumb could be more open i presume. I've seen Giovanni, a TFL member, bake miches to perfection, and i believe you aremore than capable of doing so. It may be the final tightening of the boule that squeezed the larger bubbles out? Giovanni's miches are magnificent, indeed! I really should attempt one of his formulas. I bulk fermented longer than the formula specified, because my kitchen was cool. Maybe I could have gone a bit longer. On the other hand, the complete aeration seen in the crumb suggests adequate fermentation to me. Do you think otherwise? I think mine was proofed about right. It had very good oven spring. I would have like a bit more bloom. Your point about the "final tightening of the boule. Is interesting. The instructions were to shape a "tight boule," and I did so. However, I shaped gently, too, so I don't think I changed the crumb structure too much. I think it is more a reflection of the flour used and the hydration level. I'm not unhappy with it, but I am curious about how it would turn out with slightly higher hydration - say 75%. there are aspects of this bread that your post justifiably mark out at the highest quality. I agree with your assessment of the crumb. 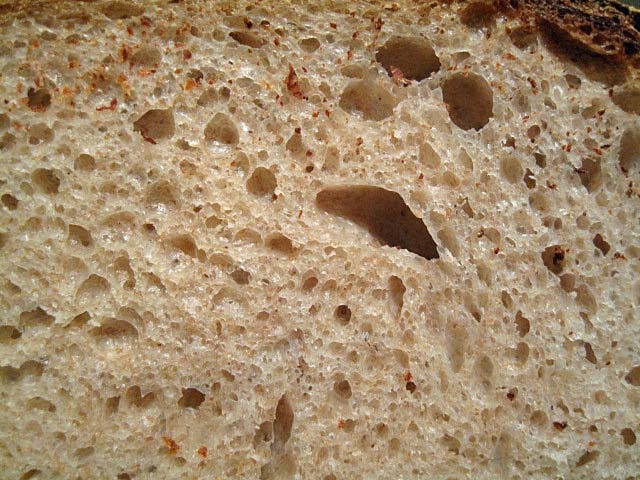 The close-up says it all; a more open crumb is not the goal here for me. The dark crust with cracks, must surely yield tremendous flavour. Gorgeous bread from clearly supreme flour. To me, the most difficult aspect of fermentation of these types of breads, especially the very large loaves, is the lower core of the loaf. So long as that is well leavened and not tight or "doughy", then the fermentation is good. When I first started baking sourdough breads, my crumb was typically "tight or doughy." At the time, I was following PR's instructions for timing of both mixing and fermentation religiously. At first, I was sure the problem was under-mixing, and I started really going for the window pane, even if it required mixing twice as long as Reinhart specified. That helped somewhat, but, of course, I was also learning how to "read" the dough at each stage. In hindsight, I now believe my early problems were much more with fermentation than with mixing. That is True, Andy! I think that this Miche is fermented all the way to the end, and the crumb structure, is that of a typical European style miche. And yes, David, more hydration would be the key to a Giovanni-style Miche. The core at the base of the middle of the loaf is the most difficult part to reach in terms of oven spring. You can see from my post of late that the dough was very well fermented, and the shaping was tight and smooth. A wet dough will enable more spring, so I guess that is one reason why a lot of people have found success with this method. However, I actually like some small amount of activity in the dough when I set it in the oven. This will induce the right amount of spring required. The dough should not be fermented to the limit of its life and beyond; over fermentation results in flavours in bread which I find unpleasant, and the keeping qualities are diabolical. So, for the homebaker making miches, to me, the difficulties to overcome relate to using an oven which is lacking in power, cannot retain heat, and so will not manage to penetrate that difficult core and induce lift in a difficult to reach place. If I'd baked the 2 leaven bread in my deck oven in College, with steam, the result would have been a more even crumb throughout the whole loaf. By that, I mean big holes and random texture throughout, as seen in the photos. As it was, the closer to the middle, the tighter the structure. It was still pretty good, and a lovely loaf of bread, but a dough piece in excess of 1.5kg baked in a domestic oven does present certain challenges. David, I'm sure you will have picked up on this from your time at SFBI: there really is no comparison between a domestic oven and the types used commercially. No matter what measures are taken regarding use of masonry to store heat. The difference in power is enormous! Thanks for your additional comments, Andy! Overall, I've been quite happy with my home oven, but, as you say, it can't match the performance of the gas deck ovens we used at SFBI. We can only keep tweaking and do our best with what we have to work with. Remember to use the velvet gauntlet. I will try this formula soon. I also plan to get more of CM's Type 85, and ask Nicky about its possible distribution beyond the Bay Area. I really can't comment on the flavor differences. They are subtle. Also, it's been a while since I tasted the original formula, and I haven't made it at home yet. I don't think you can go wrong either way. Oh my god...thank you, thank you, thank you! This miche is AMAZING! David, thank you SO MUCH for sharing this formula and your notes. I just baked this bread today. After 3 1/2 hours of waiting, I couldn't wait longer. I did a 360 degree evaluation before I cut it open, and guess what I saw? Crack marks all around the bread! When I sliced it, the lovely sound of crunchiness is loud and crisp. You are right, the colour of the crust is very dark, and I was very worried when I took it out from the oven. However, after one bite, I was in heaven, and I went on and ate a few more slices (more than I should have). David, do you think I can obtain the same quality of the bread but the dark crust if I bake this bread using the dutch oven method? Will I compromise some of the good qualities of this miche? I'm so glad you enjoyed this bread. I think it is one of my all-time favorites. I would imagine you would get wonderful results baking in a dutch oven, if you have one big enough. I am convinced that the large dough mass does contribute to the great flavor of this bread. If you do bake it again in a Dutch oven, please share your results. I'll surely share the result...I have a big enough but oval shape dutch oven.. If I do it in a dutch oven I guess steaming isn't necessary. However, how about the changes of oven temperature and timing? I did follow your advice by pre-heating the oven to 500F, then 450F for 20 mins, then 430F in convection mode for 40 mins. Should I remove the lid after 20 mins in 450F, and followed by the same procedures? I don't have any standard method for adjusting procedures when adapting a bake to a Dutch oven. Based on my current state of ignorance on the subject, I would leave the timing and temperature unchanged. My biggest concern would be burning the bottom crust. I've found that a generous dusting of the bottom of the loaf with semolina seems to help prevent this, based on a single trial.I dust the bottom of the loaf while it's still in the banneton, before flipping it onto the peel for loading. Please do share. We will all learn from your experience. Thanks for the tip re: burned bottom crust. I have this problem every time I use the dutch oven for baking bread. Will let you know the result! Can KA AP be used ? Instead of the High Extraction Flour? I guess this might be a dumb question..i have limited space so i have limited flours to bake with...could i do whole wheat with all purpose and yield a similar bread (i have the wheat germ)...it looks SOOO good...thanks!